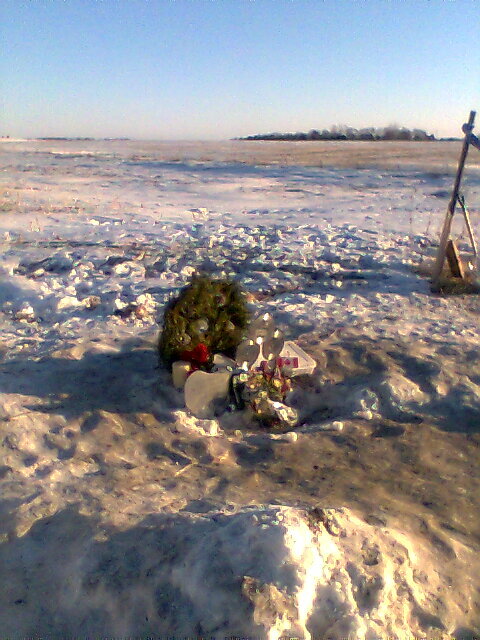 Four years ago today, on the 50th anniversary of their deaths, I drove to Clear Lake, Iowa and walked to the crash site of the plane that carried Buddy Holly, Ritchie Valens, J.P. “The Big Bopper” Richardson, and pilot Roger Peterson to their deaths. The night before, I’d watched Los Lobos, Joe Ely, Graham Nash and a slew of other performers play at the nearby Surf Ballroom, where Holly, Valens, and Richardson played their last concert. The show ended at 1:00 a.m. I rose from my hotel room at 6:00 to give me time to drive back to Lawrence, KS for an afternoon work meeting once I’d made the pilgrimage. So I’ve loved Holly’s music for decades, and always took some comfort in knowing there was a large constituency of older music fans who felt the same way. Every February 3rd, I’d tune into whatever oldies station I could pick up and communally grieve the collective lost potential of these three performers. That morning it was sunny and 15 degrees below zero plus wind chill. The crash site is in the middle of a field. Snow was plowed into three-foot-high embankments on both sides of the road. There is a tell-tale path along a fence row, with snow crushed down by visitors. The gate to the crash site is shaped like horn-rimmed glasses. I wore a pair of Doc Martens I’ve owned since the early 1990s, shoes that have a good chunk of nostalgia associated with them in their own right. What they don’t have in their own right is soles. They’re worn to a flat, plastic veneer with no grip whatsoever. Put them atop thirteen inches of snow, melted in yesterday’s sunshine and re-frozen overnight, and they might as well be made of butter. I only slipped and fell twice on the way to the crash site, both times on my face rather than my back. I realized I was crying about fifty feet past the gate. Not from emotion, but from the cold. My squinted eyes were battered by wind, and tears froze against my cheeks. I tried to inhale and realized my nose hairs had frozen into sharp little icicles. I pushed forward. The walk fosters a sense of insignificance before you ever reach the site. The horizon stretches for miles, an expanse of flat Iowa farmland punctuated by single pine trees and a water tower or two. The morning sun turns random patches of ice into golden amoebas sprawled on the ground. Reaching the crash site reminded me of stories I’ve read about climbers on Mt. Everest. You get there. It’s a touching, beautiful moment. Then you have to immediately turn around and go back, because you’ll freeze to death if you stay. The small shrine has a few gold records, the names of the musicians, and whatever items visitors have left. A frozen wreath. Toy ’50s replica cars. Guitar picks. When I reached the site, two tourists in parkas and angular haircuts stood with bowed heads, whispering in German. We nodded to each other but never spoke. I can’t really put into words what Buddy Holly’s music meant to me growing up, and I couldn’t really reckon with it then. I stood quietly, tried to do something to honor the dead, came up wanting, then turned back to head for the car. It was one of those moments where terrible weather and physical pain fight with melancholy and beat it to smithereens. Yet I’d still do it all over again. Apparently, a lot of the folks from the previous night’s concert had walked out to do a candlelight memorial when the show cleared out at 1:00 a.m. It was just as windy, but even colder sans sunshine. Nostalgia drives me to do crazy things, but I draw the line somewhere. This entry was posted in All Posts and tagged Buddy Holly, Clear Lake, Fifty Winters Later, nostalgia, Ritchie Valens, Science Fiction and Music, The Day the Music Died. Bookmark the permalink.